The 2018-19 Free Application for Federal Student Aid (FAFSA) and California Dream Act Application (CADAA) open October 1, 2018. Your FAFSA or CADAA must be submitted by March 2, 2019 for Cal Grant consideration. Attend a FREE Cash for College Workshop to receive help completing the Free Application for Federal Student Aid (FAFSA) or California Dream Act (CADAA) and Chafee Grant for Foster Youth applications. Grants are awarded based on financial need and do NOT need to be repaid. One of the largest grant programs is the Federal Pell Grant. Federal and state governments, colleges, and individual organizations also award grants. Scholarships do NOT need to be repaid and are awarded for many reasons - academic, financial need, ethnicity, organizational membership, private organizations, etc. Better known as Work-Study programs, provide part-time jobs so students can earn funds to pay for their education. These are offered by federal and state governments as well as individual schools. Loan Aid: Loans are used to cover a portion of the college expenses and may come from federal and private sources. There are many types of loans; Federal Perkins, Federal Stafford, Subsidized Stafford, Direct Unsubsidized, Direct PLUS Parent Loans and Private Loans. Please be sure you are well-- educated in the types of loans you are considering. FAFSA is a form to be completed annually that determines eligibility for student financial aid. It is a gateway for all types of financial aid programs including most institutional aid, 605 state aid programs, and nine federal financial aid programs. All students are advised to complete the FAFSA since colleges and universities will NOT award money (including merit-based) unless the form has been completed. Application period is January 1 - March 1 of the year prior to starting college. Apply online at: www.fafsa.ed.gov or call 1(800)433-3243. 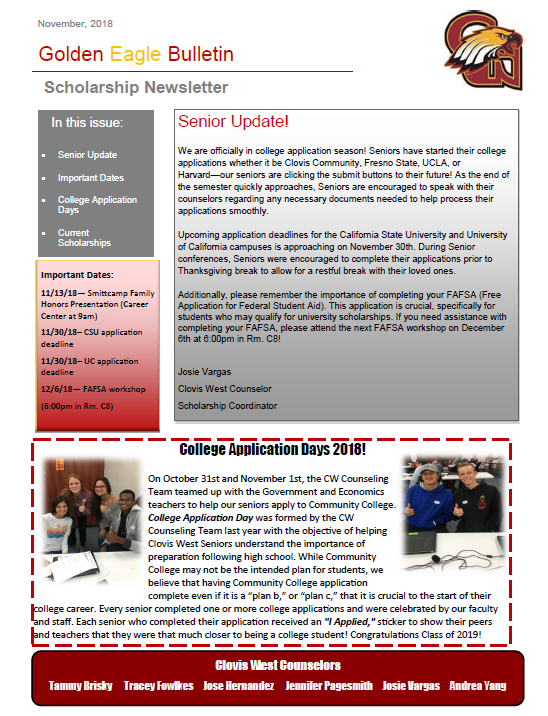 Please have your student stop by the Counseling Center and pick up a current Scholarship Bulletin listing any upcoming scholarship opportunities including a comprehensive list of Scholarship search engines they may utilize to further enhance their financial aid opportunities. Did you attend elementary school in the CW area? Select your elementary school below and complete your application today! All applications are due in the Counseling Center by Friday, April 26th!